Recently, the subject of die-casting versus sand-casting has been a topic of interest in our industry. Since GLM is a leading manufacturer of aftermarket marine parts, we would like to add to your marketing and technical knowledge on this subject. 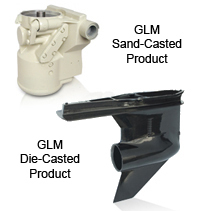 As you may already know, GLM currently produces both vacuumized sand-cast and die-cast products. The most interesting example of a GLM die-cast product is the Stringer upper gear case, while the most interesting example of a GLM vacuumized sand-cast product is the Alpha One lower gear case. Whether or not a product is sand-cast or die-cast is determined by many considerations. One of the main considerations that GLM uses for any product, that it produces is: can we improve it? There are many examples of GLM products that have improved engineering and the Alpha One vacuumized sand-cast lower case is a perfect example of GLM improved engineering. The original Alpha OEM case is indeed a die-cast product. However, due to the fact that this particular product is the heart of this drive unit and operates below the water line, GLM wanted to make a more reliable stronger case. Vacuumized sand-casting makes it possible to cast with more resilient aluminum alloys which cannot be used in die-casting. This increases strength and the overall amount of aluminum in the final product. If you weigh a die-cast Alpha One case and a GLM vacuumized sand-cast case, you will see that the die-cast case weighs approximately 141/2 lbs. and the GLM case weighs 16 lbs. The extra 11/2 lbs. is simply due to more aluminum in the GLM case. The OEM Alpha die-cast case uses A380 aluminum alloy. This is required due to the die-cast method and it produces a case that is more susceptible to breakage. We are sure that you have all seen drive units with broken cavitation plates and/or a broken skeg. By using the vacuumized sand-cast method, GLM is able to utilize a much less brittle A356 aluminum alloy. This is the same alloy used in making many automotive/truck wheels and speaks for itself in regards to the strength of GLM Alpha One cases. As a matter of fact, OEM Volvo lower units are also sand-cast for these exact same reasons. Additionally, many may think that a die-cast case is more precise than a vacuumized sand-cast case. In reality, there is only a slight cosmetic difference on the outside of the case and the GLM five step finish process compensates for this difference. The internal tolerances for both die cast and sand cast cases are all machined after either of the casting processes is complete. GLM hopes that these casting facts will help you in marketing our products and also give you the real facts from the original manufacturer.